There is a huge difference between “engineering” and “design thinking”. 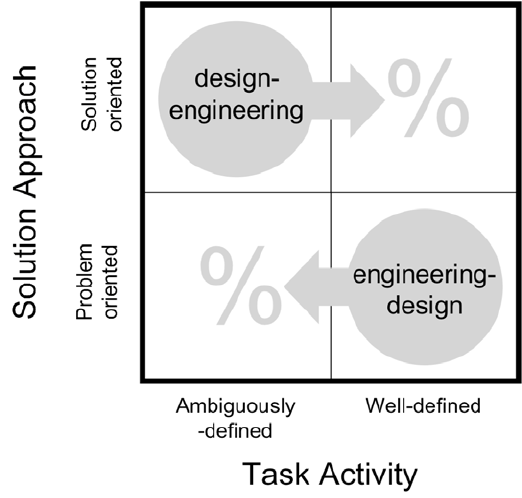 It comes down to that engineers are problem-oriented, a design thinker is need oriented. That’s a fundamental another approach. For an engineer the problem is obvious, As you can see in the image below, it is even not mentioned at all! The conceptual distinction between design thinking and engineering makes us clear why some technical solutions don’t work at all, or are actually simply not used. We should be happy that there is a solution, but we are not: the solution works, but is highly irritating. There is a satisfying solution, but it is badly designed. The thinking behind has been problem-oriented, not user oriented. I often get asked what the difference is between those terms. “Is lean startup opposite of design thinking? oh no, maybe it is the same?” and “Ah ok, so you mean agile?” or “I think Agile is a better word for it”. Those are some of the comments I get whenever I talk about one of the terms above.